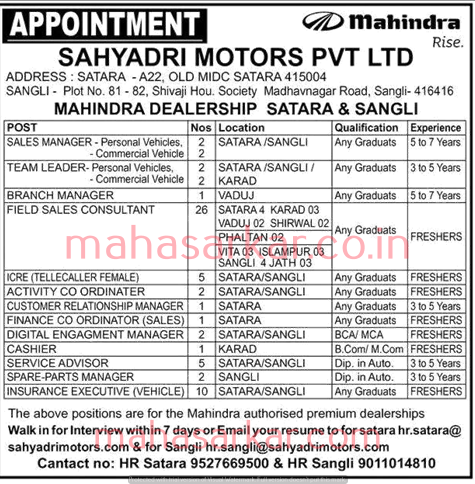 Sahyadri Motors Satara (Mahindra Dealership Satara & Sangli), Published Job Notification for 64 Junior Engineer & Senior Section Engineer Posts. Candidates who wish to apply must look at Sahyadri Motors Satara Junior Engineer & Senior Section Engineer Recruitment 2018. Eligible candidates can apply Offline or Online before 20-08-2018. Plot No. 81-82, Shivaji Hou. Society Madhavnagar Road, Sangli – 416416. Starting Date, Last Date to Apply Offline or Online at Mahindra Dealership Satara & Sangli which candidates should be remembers as follows. Walk In Interview Date: 31st July 2018.